There is no more contentious city on the planet than that of Jerusalem in Israel. It is the center of three large scale religions, is claimed as the capital by two countries, and is always in the headlines. With all the controversy and violence that always puts the city in the headlines it is hard to actually view the human aspect of living in the Holy City. Jerusalem gives an interesting look into normal life in the city. 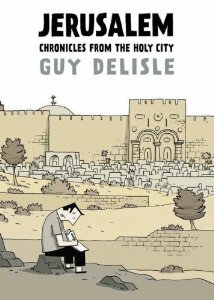 This graphic novel tells the story of Guy Delisle’s one year stay in Jerusalem. He is there with his wife who works for Médecins Sans Frontières (Doctors Without Borders) and while she is out working at various hospitals around Israel and Palestine, Mr. Delisle stays in Jerusalem taking care of his children and exploring the city. Guy Delisle is one of my favorite authors/graphic artists, as his travelogues (which Jerusalem is the most recent) are not only beautifully written and drawn, but also give an amazing insight into the lives of people in foreign countries that people in the West don’t get a chance to experience very often. The graphic novel is broken into twelve chapters which are based on the month of the year that the events take place. Each chapter has more than a few short stories which are all only two or three pages long at most. Each story tells of a specific interesting instance that Mr. Delisle experiences in his daily life. One interesting story tells how on Yom Kippur all major streets a temporarily blocked off. This is because Yom Kippur (a major Jewish Holiday) is the Sabbaths of Sabbaths and as well all know Sabbaths in all Abrahamic Religions are days of rest. In Israel on this day rest is more or less forced on all, hahaha. Another more serious story tells about the Israeli Remembrance Day or Yom Hazikaron. This is a state holiday that is Israel’s equivalent of America’s Memorial day. However, this memorial day is expanded to include the victims of the Holocaust as well as and Jews who died in the foundation of Israel as a country since 1860. The main even of the day on this holiday is the moment of silence. During this moment of silence sirens are heard throughout the country and everyone, no matter what they’re doing stop stand up and stand silently for a minute. Everyone is involved in this. Cars on major highways stop and their passengers get out to observe it. A video of this can be seen here: http://www.youtube.com/watch?v=80de02Skgdk . In Delisle’s story he witnesses the moment of silence as all those around him stand as the sirens blare. All those, except for tourists he talk loudly and don’t even seem to notice what’s going on. As well as focusing on Israeli’s Delisle also focuses on the Palestinians who live and work in Jerusalem. Most of these instances are also quite sad as in many of the stories which include Palestinians they are more or less treated as second class citizens. For example Delisle and his family live in a Palestinian district in Jerusalem. Despite the people in the district paying trash pick up taxes to the city, their trash is never picked up and their living standards are noticeably lower than their Jewish Counterparts. 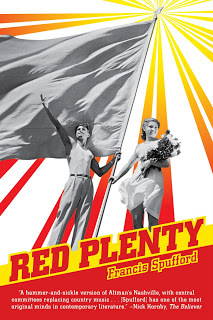 I eagerly suggest this book as well as any of Guy Delisle’s other works for anyone who is interested in places that are generally ignored by the mainstream. I suggest this book in particular for anyone who needs a good introduction to the problems of Israel and her sister Palestine.